since i write a lot, and i enjoy getting to know flickr artists and have you know me i wanted to share my studio with you all….and…i love my studio (which i designed myself) and wanted you all to see it. background: i have always had a studio. when i was very young i painted on the kitchen table (i’m sure we all did…and maybe still do!). in every home we’ve had, i have had a studio. in our first apartment i painted on the floor in the t.v. room. i was more "supple" then, so down on the floor worked for my knees! when we lived in italy and twice in germany our apartments were large enough for me to have my own room for making art. when neal and i first bought our house here (years ago) i was creating 2d art, mostly acrylic painting. i also was a part owner/artist in a gallery on conn. ave (in washington, dc, usa) working in stained glass. since i was cutting glass i needed a hard floor surface (easier to clean up). the downstairs of our house lent itself to this and i was happy there. then off to heidelberg, germany for 12 years. when we returned to the states i was no longer doing stained glass and david (our son) was off at college, so i turned the small upstairs bedroom into my studio and again spent many happy years in that room. but….i out grew the room! i was making many art pieces, acquiring more objects to use in my art, etc. neal and i had renovated our house twice (i did all the design) and now it was time for the third renovation…turn our huge attic, with very high ceilings, into a studio for me (by the way…we renovated another time after that…the kitchen. four renovations in all! i think we are done now). so..back to the attic renovation: i knew exactly what i wanted……a studio that would look like a (french) artist atelier…..i did the design, found a contractor and viola! my new studio! when i look at it (it stretches across the entire house) i am amazed that i was able to work in the small room below. i removed the ceiling in the small bedroom…now i have a wide open space in part of my studio which affords me access to the window below (since i do not work from nature natural sunlight is not that important to me, but i do like to be able to see the beautiful maple tree that is outside the window. i used the framing for the original attic stairs and made a glass block floor…now i can see down below and light filters up into my studio. the cat was very cautious when she first saw the glass block floor. she wouldn’t walk on it because she didn’t realize that there was a "floor" since she could see down. now she sleeps on it. many folks who come to my studio are also similarly cautious. i always give a demonstration and walk on the glass. i have a small closet at one end with a sink (i ran the plumbing up) so i can wash my brushes. i stained my floor white and used 5" wide oak planking. i know, white in an art studio, what could i be thinking!!! !….but i am looking forward to it aging and getting lots of colorful paint splatters on it. i have built-in shelves and also several stand alone book cases to hold my found object treasures, paint, etc. my table is an old work bench that i found in the trash and painted "bubble gum pink". since my studio ceiling is so high i was able to use the (former) attic stairs and now also have a stand up "upper attic" for camping gear, and various other odds and sods. i insulated the upper attic and the walls. i am warm in the winter and cool in the summer (a ceiling fan also helps). i have sloped walls on three sides of my studio. that adds to the "old studio" look that i like. i have a lot of "stuff" in my studio that i use in my art. my studio is rather organized, as i would never find anything otherwise. although when i work there is art stuff everywhere. actually neal likes it better when it is messy! what i like best (aside from everything!) about my studio is location location location! i try to work every day in my studio. the fact that it is just upstairs gives me no slothful lazy excuse to not work. also i can even work without getting dressed (though of course i do dress), i can work in my studio in all sorts of weather…i don’t have to worry about snow, sleet, ice, record heat, etc. and, when i need a break, i can trundle downstairs, go out in my garden, write on my computer to you all, and i can always drop what i’m working on because helena is coming! also i like helena having access to my studio. she is very into projects (she calls herself a "project fairy"). we are often in my studio as she picks out "stuff" to use in her art. do i mind working "alone"…not in a shared space as some do? no…because when i work i am not alone..i am with myself and my art. i never feel lonely. and if i need feedback, i always ask neal, my biggest fan, what he thinks. i don’t always follow his opinion, but i always like to have it. and now that i am a flickr-ette, i post my art here and always get lots and lots of feedback. and my cat likes having me in the house with her. she is such a baby! she stays in my studio with me, and has often gotten paint on her paws! in mid april i was contacted, via my website, by the editor of STUDIOS magazine, asking if i would agree to have my art studio featured in their magazine. she told me that she had seen my studio and art through a dc based art group. i was never able to ascertain from her which one exactly ( i belong to 3 groups here). after several back and forth emails, to find out the details, i, of course, agreed! neal and i spent several days taking many many many photographs of my studio to send to them. i had to send 15 photographs (they will choose among them) and also do a write up about my studio (there were several key points they wanted addressed for the article). the STUDIOS magazine is quite nice. of course i rushed out and bought a copy of the spring issue and was impressed with the magazine, the format, photographs in it, write ups by artists about their studios. i sent the required 15 photographs (they will not use all 15 but will chose among them. i have no idea which photographs they will use) and my write up…..again they may edit. it had to be a certain amount of words only…..knowing what a "talky" person i am i had to keep writing and reducing to stay within the limit. my art studio will appear in the FALL issue, which will be in book stores (like borders, etc) starting 7 august. i am very excited about being in this magazine and having my art studio seen across america. i am not sure if this magazine is sold abroad, but it may be in such countries that carry american magazines ( for example, there are many bookstores in paris that are dedicated to english books and magazines). although these are NOT the photographs i sent her, you can get a peek at my art studio that i have posted on my flickr. at the top there is one main picture. if you scroll down you can see several other photographs. my studio has changed a bit since i took these (original photgraphs) and that is reflected in the photographs in the article. i hope you will buy the magazine so you can see my art studio as it is now. 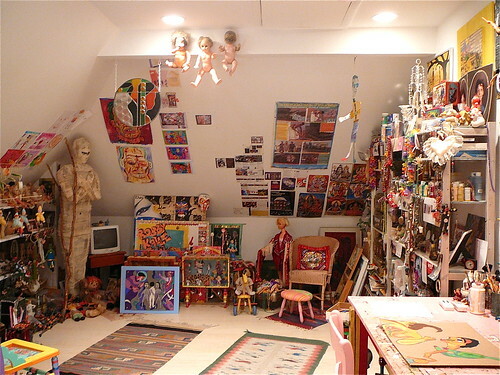 my studio is an art work unto itself……a true assemblage piece! i am a self taught artist, a devotee of found objects, street trash, bones, teeth and blood, who uses materials as a total gestalt to create images from the turmoil of my mind – an artist outside the edge. there is no object i can resist and bring to my studio, where it waits…a silent muse…for my next art piece. i have always had an art studio. i began painting at age 10. at first i used the kitchen table (doesn’t everyone!). at one time my art studio was an 8 by 10 rug and i painted squatting on the floor. now my studio is a converted attic. i live in an historical registered home and could not put windows or a skylight into the roof. so i removed the ceiling of the bedroom below and added a partial glass block floor for light to filter into my studio. i like having my studio in my house. i work in my studio everyday, from dawn until dark. having my studio close at hand is convienent..no need to worry about going out in inclement weather. i don’t have to dress to work in my studio…art can be so deliciously messy. i work in a myriad number of media and have large and varied art supplies and need a really big space. all my supplies are out in the open, easy to see. i enjoy being surrounded by my materials and objects as they are a source of inspiration. “the more chaos the better” seems to work really well for me. my studio is a work of art unto itself…an installation piece. i have many art supplies and had to be creative in storing them. i find that open shelving allows me to readily see what is available. i use tin boxes, old candy and lunch boxes, clay pots, large seashells, woven baskets and mason and jelly jars that afford me a view of what is inside. animal skulls and old dolls are hung from the rafters, as are mobiles. my floor, old wide white planking, is covered with art pieces that are not currently hung. my walls are adorned with photographs of art pieces that i have sold …this way i can still enjoy them. i found my work table in the trash. the rustic style and bright colors immediately appealed to me. i could call my art outsider, visionary, raw, collagist, folk, emerging ……but the word that best defines me and what i do is…….artist. if you do not have a sink in your studio add one. i found this to be the most helpful thing i did when renovating my attic into an art studio. also put 3/4 inch plywood behind the drywall so that (heavy) objects can be hung. if your studio is in a converted attic do not forget to put in a ceiling fan! i hope you all get a chance to see "me" in the magazine. it is quite a thrill for me.